Woke and walked Mix before breakfast. 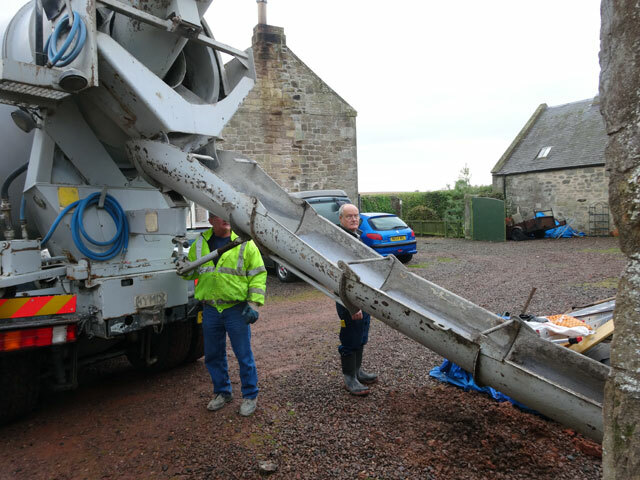 Tom and David arrived early because this morning concrete was being delivered. Soon we were swimming in the stuff and I discovered a fascinating fact – the first shovel-full of concrete weighs nothing at all, the hundredth shovel-full weighs about half a ton. And then when you come to sawing the concrete level, you really are into back-breaking territory. In the midst of concreting the Bothy floor, Ewen and Jane from Australia returned. It was grand to see them and after we had completed the concrete work we all (Tom, David, Jane, Ewen and I) went off to Pearsons for lunch. Never did haggis taste so good. In the afternoon Tom retired to his home to rest his back while David drove Ewen, Jane and me on a mystery tour which started at the garden centre in Berwick and went on to Eyemouth, St. Abb’s and Coldingham Priory thus ensuring that our visitors saw a little bit more of this are of the Scottish Borders. In Eyemouth we walked around the harbour, through the town and along the front. The tide was well in and so there was very little beach. We did find a chandlers (where I bought a few shackles) and an ice-cream parlour (from which we all got an ice-cream cone). At St. Abb’s we looked over the rocks outside the little harbour and explored the Visitor’s Centre; and at Coldingham we wandered around the Priory (now the parish church). The little church notice board at the gate has some beautiful carving on it – I was reminded of the care with which so many people do the tasks entrusted to them, in this case turning a functional church notice board into something of a work of art. Back home, it was soon time for dinner. Rachel had returned from her stained-glass class and was out again as soon as she had eaten, this time to go to her choir in Berwick. After our meal (at which David joined us) we all sat and chatted and then Ewen, Jane and I retired to the Granary to continue our blethering until Rachel returned home and soon afterwards it was time for bed (after, of course, walking the dogs). It has been a really good day – but my old body is extremely sore after all that concreting.